September 22, 2016 was travel day to Oswego. 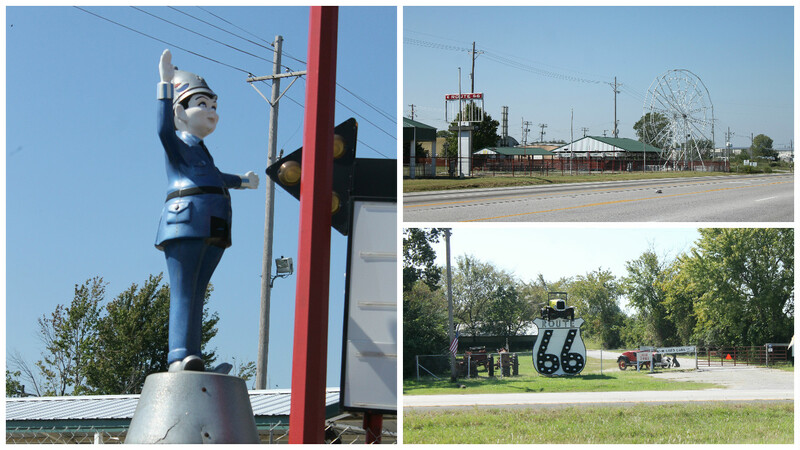 Another small town in the middle of farms and prairies, that got us back to Route 66. We stayed at the Hillside RV Campground. A no frills park that is kept up very well. The owners were great and very helpful. After pulling into our spot, gravel with grass and a nice shade tree outside our door, we discovered the electrical hook-up wasn't working. They came right away to our site and replaced the breaker, so we didn't have to unhook everything else and move to another site. Lots of places for walking the dog, big fields on both sides of the park. 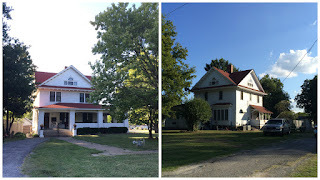 We paid $18 a night with our Passport America discount. Back on Route 66 we started off in Joplin, MO where we finished last time and went to just outside of Tulsa, OK. 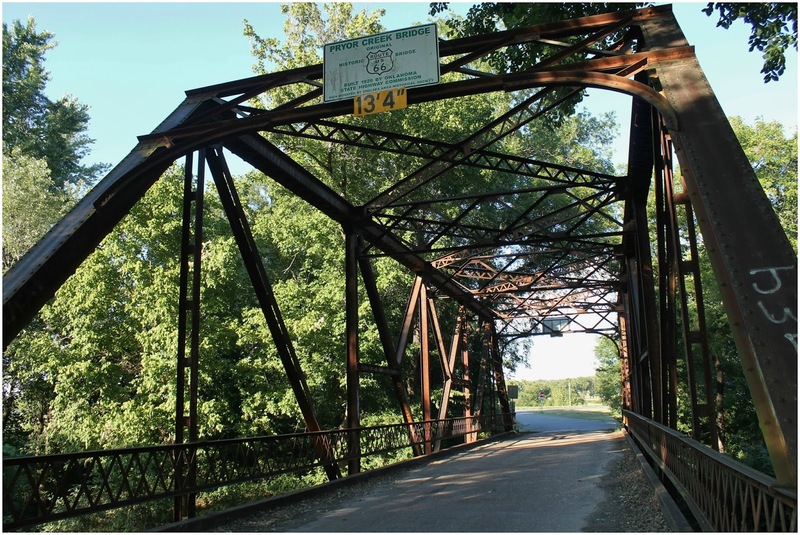 The stretch through Kansas is only 13-miles long, and was one of the few paved sections back in the day. 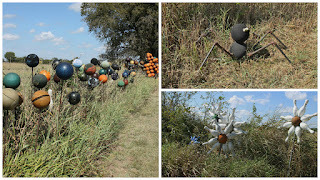 It may be a short distance but we did find a number of things to do. 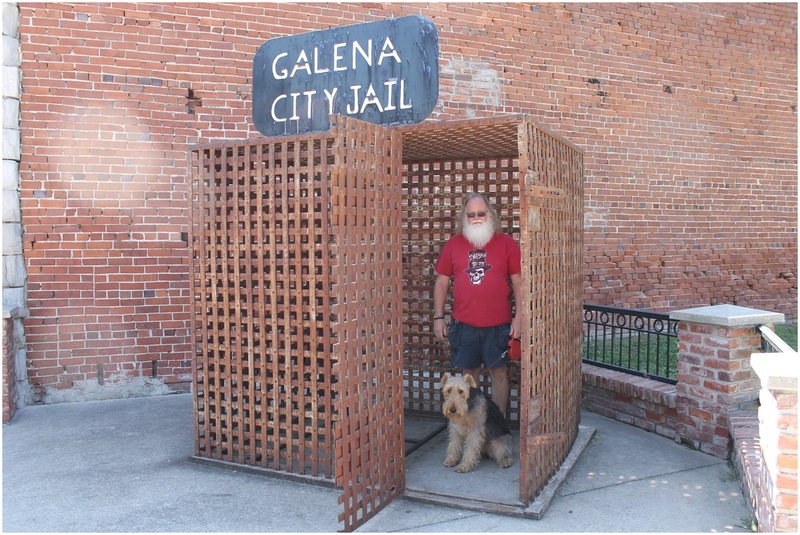 Galena is the first town you come to, it once was a booming mining town. Today it is still a busy town just on a smaller scale. 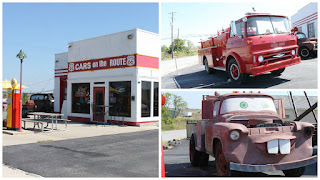 Cars of the Route is a small diner that used to be a service station. 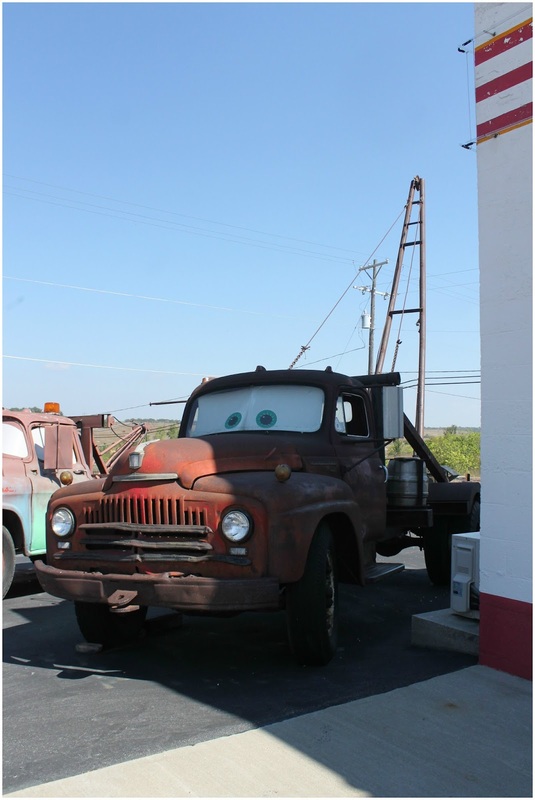 The inspiration for "Tow-mater", from the Disney movie "Cars", sits in the parking lot, along with a few another old cars and trucks. The Galena Jail was a great spot to put Les and Mielikki to keep them out of trouble while Nancy took pictures. Riverton is the next town, there is an old amusement park on the side of the road. The Eisler Brothers Old Riverton Store was a fun place. It was built in 1925 and was a popular stop on the route. They have a deli where you can get some tasty looking sandwiches to go or eat there. 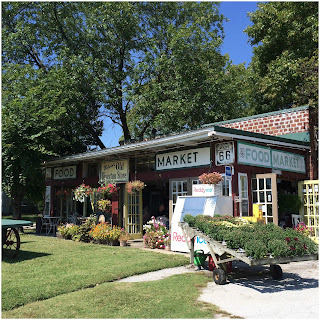 They have a tiny general store with just about anything could want, groceries to office supplies, plus Route 66 memorabilia. The Bush Creek Bridge is the only remaining Marsh Arch Bridge (named after the architect) left on the route in Kansas. The other two were dismantled in the '90's. While we were there taking pictures we met a couple from Warren, MI. As we stopped along the way at other sites we kept running into them. 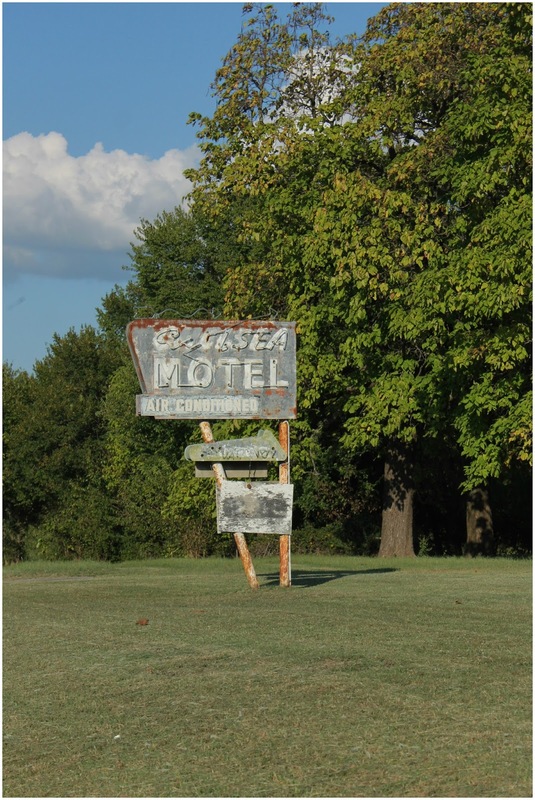 Baxter Springs is the last town before the boarder. 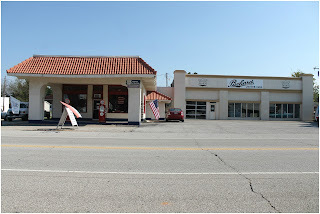 The Route 66 Visitor Center is in the old Baxter Springs Independent Oil and Gas Service Station building. 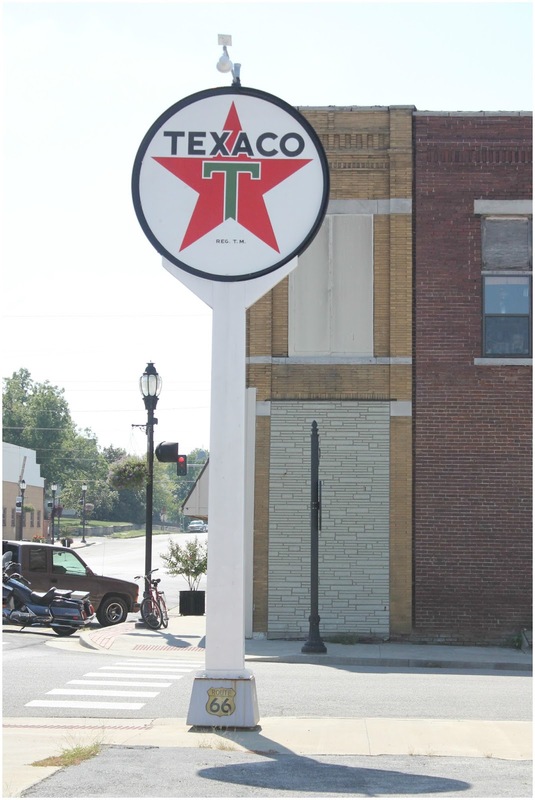 During the Great Depression, gas companies had to get creative to rebuild their brand. Many started building cute cottage type buildings to bring customers in. When this one opened in 1930 it was considered the finest Tudor style cottage in the area. 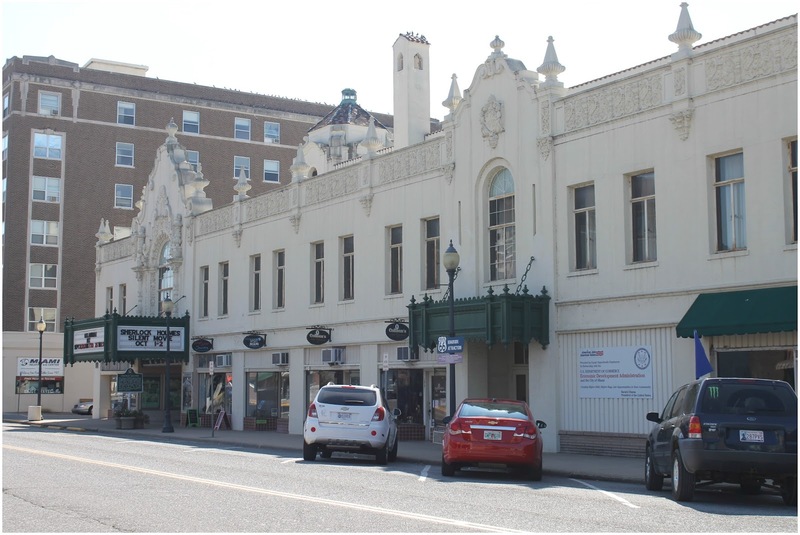 It has changed hands and businesses over the years, but in 2003 it was placed on the National Register of Historic Places and funds were raised to bring it back to its original glory. It is filled with old photos and memorabilia. The older gentleman who volunteers there was an absolute hoot. He was giving a young couple directions on how to get to other sites, he was drawing out a map for them. It took about 20-minutes to get it all done with stories included about each place. It was great listening to him. 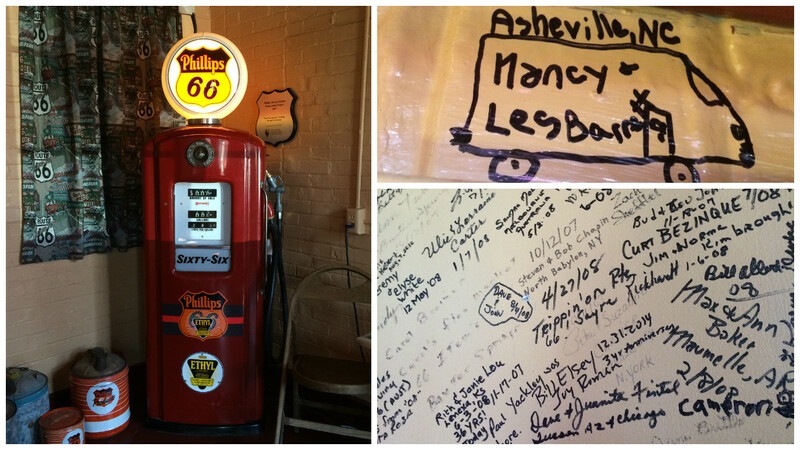 You can leave your mark on the walls, as thousands of others have. They are filled with peoples signatures, remarks and drawings. It was pretty cool reading them, we of course added our own to the mix. 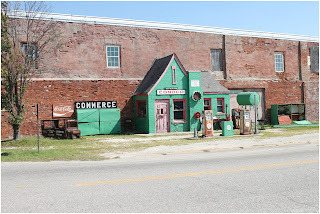 Commerce, OK is where the land starts to get flat as you leave the Ozarks Plateau and enter the prairies. 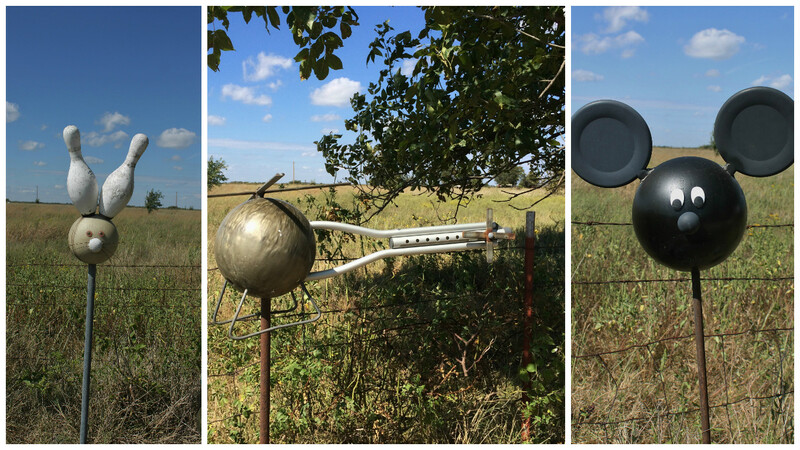 It is also "Tornado Alley", with about nine watches a year, thankfully there were none on this day. We stopped at the Dairy King which was once a Marathon Service Station, and now is a dinner that offers Route 66 shaped cookies for dessert. 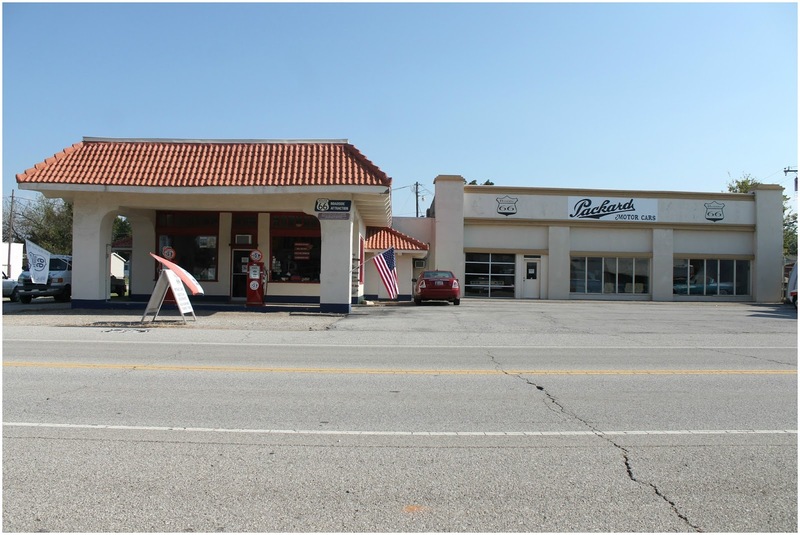 Across the street is the adorable 1929 Conoco Hole In The Wall, it has been a number of business over the years and now sits empty. Bonnie and Clyde share a history with Commerce. In the spring of 1934, they killed Constable Cal Campbell here and kidnapped Chief Percy Boyd and later released him in Kansas. This was the last murder they committed before being gunned down. Baseball Hall of Fame player, Micky Mantel spent his childhood here. 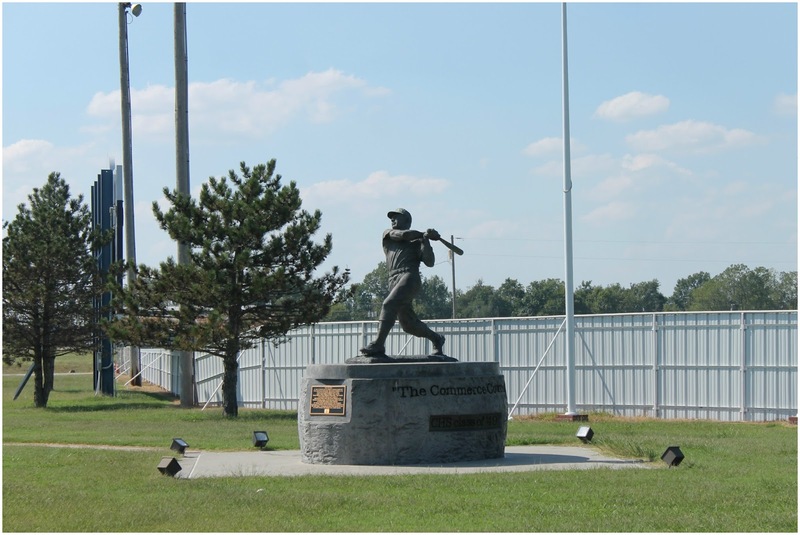 They have a statue of him in front of the high school baseball field. Miami was next where we saw the Coleman Theater. It seats 1,600 and was built just before the Great Depression. 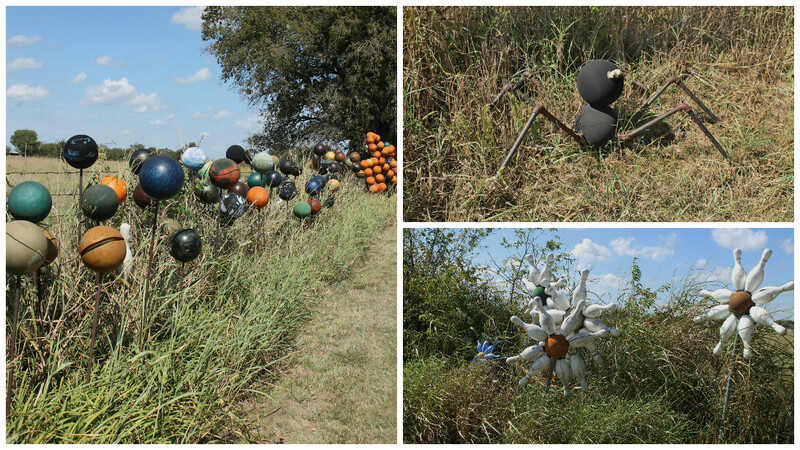 It was considered to be the most elaborate entertainment venue between Dallas and Kansas City. It is one of the best surviving examples of a Spanish Revival building in Oklahoma. 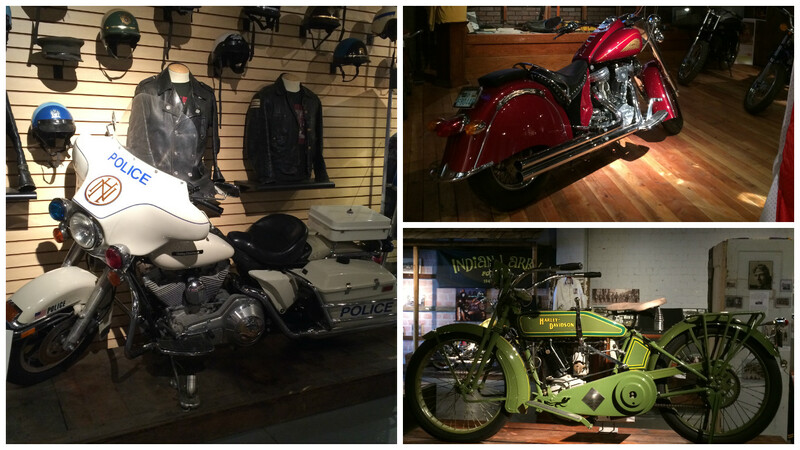 We made a stop at the Vintage Iron Motorcycle Museum. They have about 40 vintage motorcycles on display. 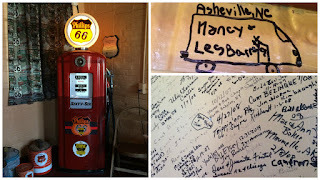 The Harley Police motorcycle brought back memories for Nancy. The father of her best friend Gail, was a Detroit motorcycle cop. One day the two of them thought it would be fun to sit on his bike. Well, it was until it fell over. Luckily neither one of them got caught under it - but they sure did get into a whole lot trouble! 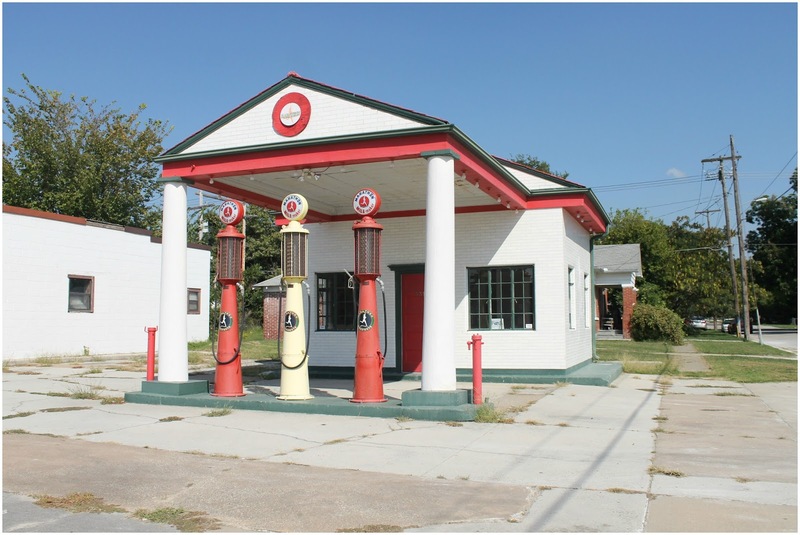 The 1929 Marathon Oil Service Station was one of the few to have Greek columns. 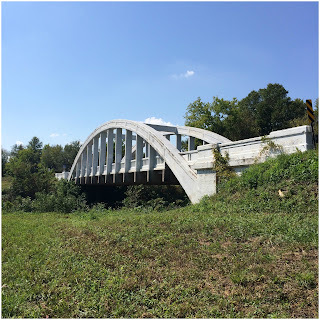 Between Miami and Afton you can drive on one of the oldest roadbeds that is still drivable on the route. It is called the "Sidewalk Highway". They advise you not to take it when it is wet and to go slow in a low clearance vehicle. At the end of it is a historical marker and a strip of the road where you can still see the curbs. 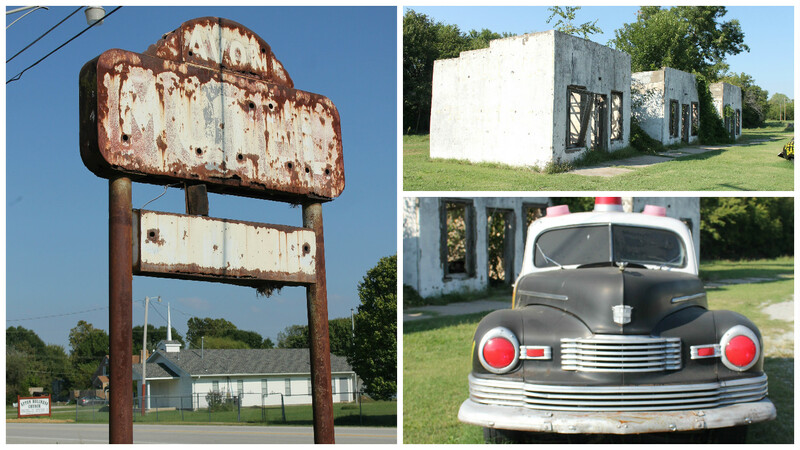 There is not much left to Afton except for the Packard Museum. The building is a 1933 D-X filling station and was one of the first 24-hour filling stations on the entire route. There are a number of old signs and motels. 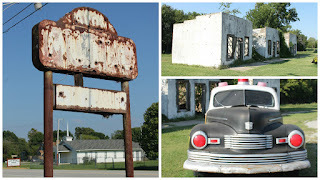 All that's left of the Avon Motel is the sign and the walls. Our last stop the first day was in Vinta, home to Clayton's Cafe. It is the oldest continually owned family restaurant on the route in Oklahoma. 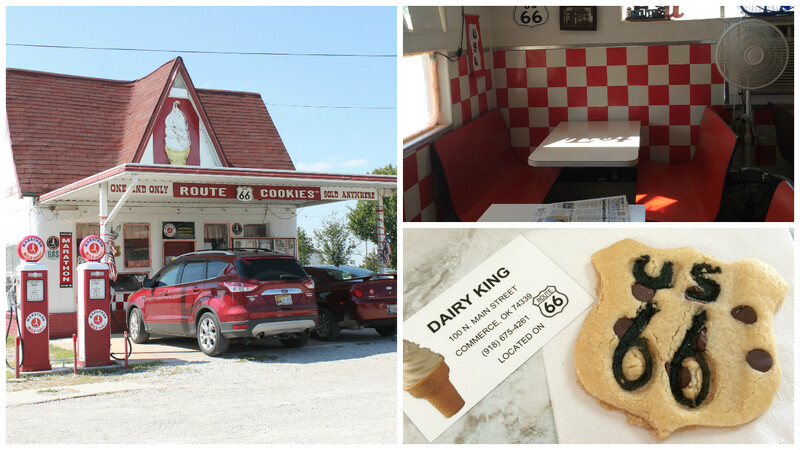 They have been feeding locals and travelers since 1927, one year after the route opened. There is also a small Easter Trails Museum, but both times we were in this town it was closed. Second day out was just as much fun. 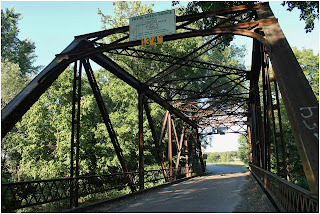 As you enter Chelsea you come to the Pryor Creek Bridge, the route crossed this bridge until 1932. Also in Chelsea you will find one of the Pedestrian Tunnels were built in a number of places to allow safe crossing of the highway. 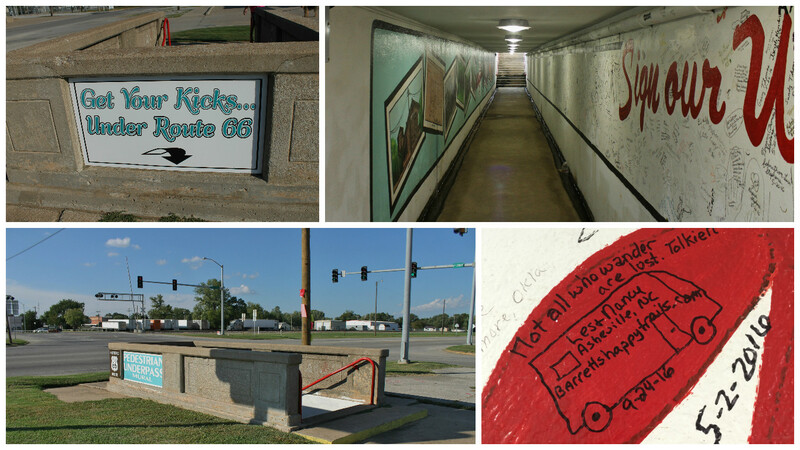 This one has a mural of local attractions on one side and the other side is for people to leave their own mark on history. The Hogue House is believed to be the first Sears House Kit in Oklahoma and one of the first to be built west of the Mississippi River. The 2,400-square foot 4-bedroom home cost $1,663 dollars. Everything was cut to size and shipped by railcar. 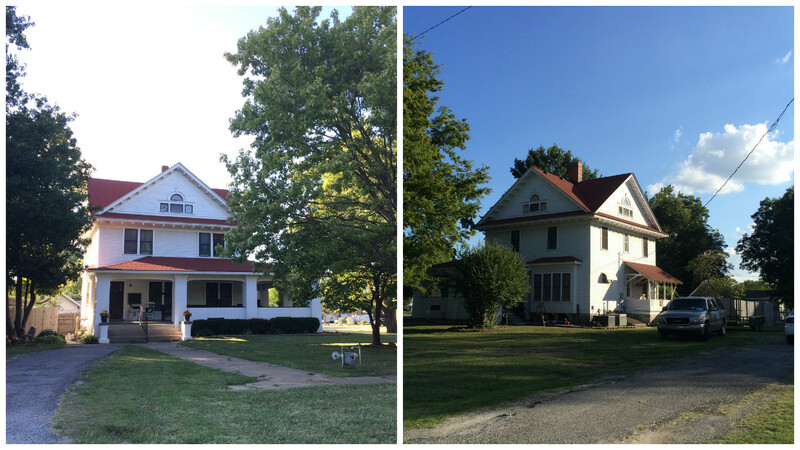 The house remained in the same family from 1912 to 2014 when it sold for $137,000. Will Rogers was born just outside of Claremore in the small town of Oologah. Route 66 is called the Will Rogers Highway in a number of places and there are quite a few schools, museums and parks named after him along the route. 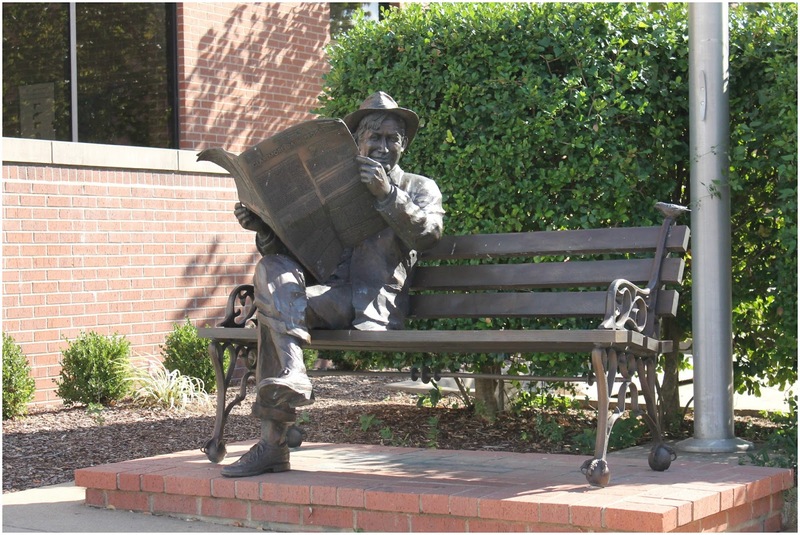 Outside of the Claremore newspaper office we found a statue of him reading the paper. 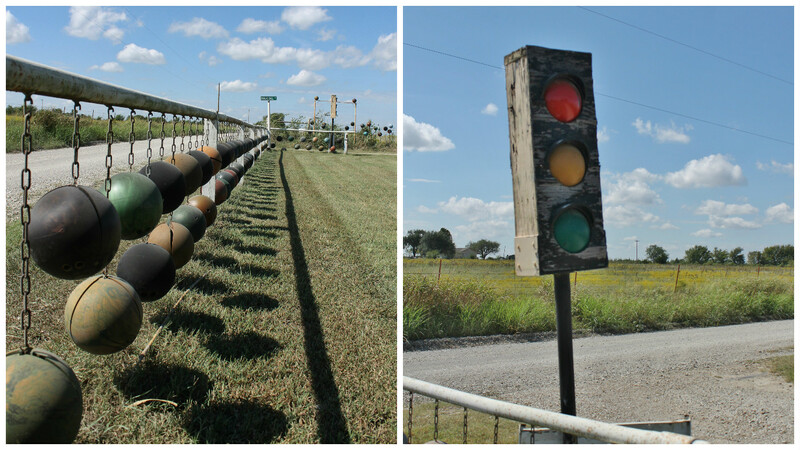 We made a few detours on the way to visit some Roadside Oddities. 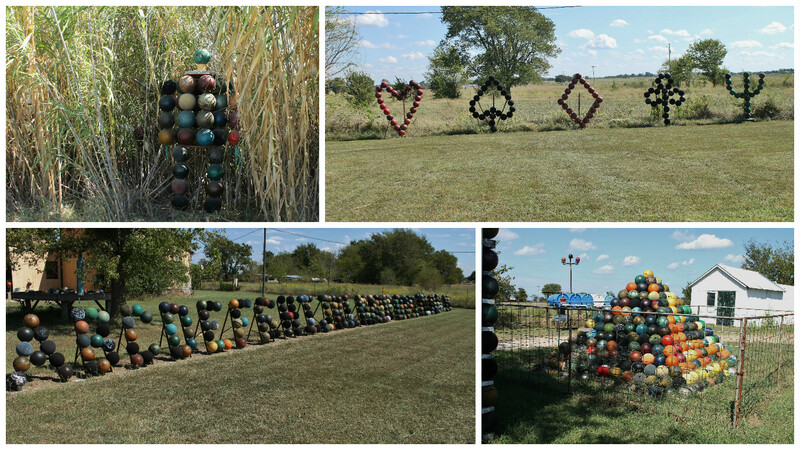 First was Chris's Bowling Ball Yard Art in Nowata, OK. Chris was mowing the lawn when we showed up and stopped to chat with us. He has been developing this over the last 15 years. 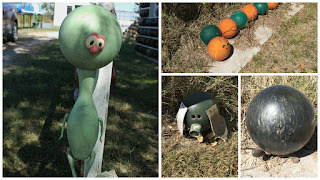 His wife used bowling balls as gazing balls in her many gardens. 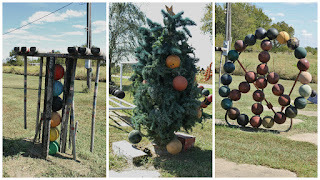 When she passed away he didn't know what to do with all of them, so he started to create things and as is the case so many times one thing led to another and he now has a yard full. 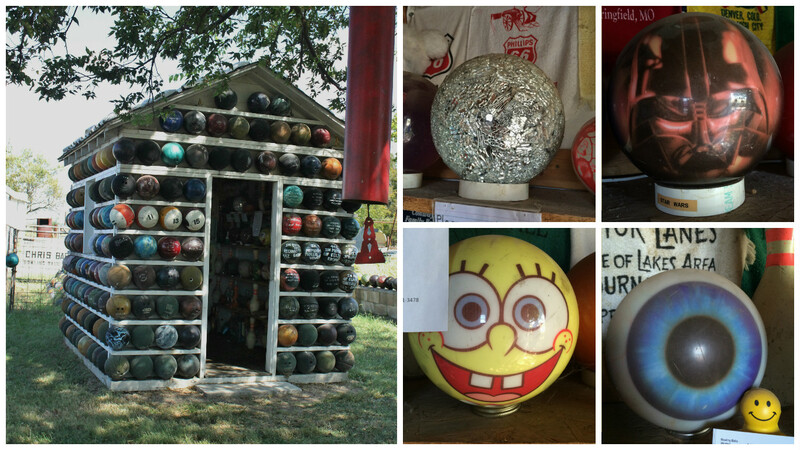 The shed is not only lined outside with bowling balls, but is also full inside with balls, towels and pins. 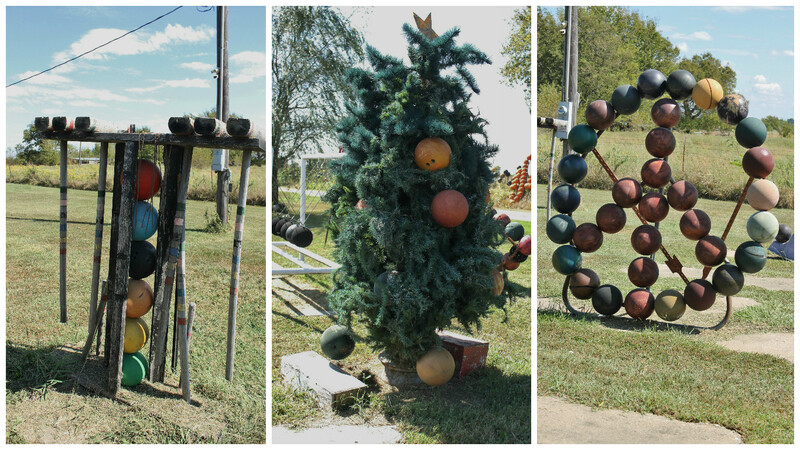 He has a whole barn full of balls waiting to use. 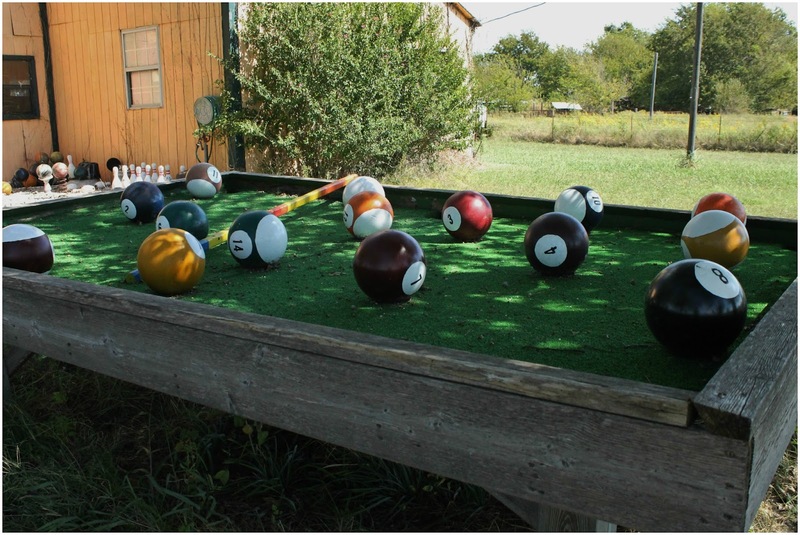 People have sent him balls from all over the country. It was a great stop, we love when the artist is around to talk to. and a 90-foot tall Totem Pole with 200 carvings on it. 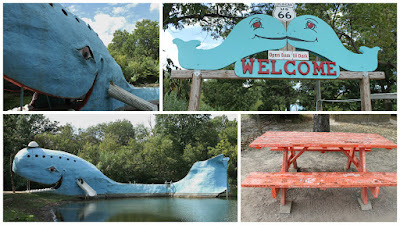 The last stop of the day was in Catoosa where we found the Blue Whale. 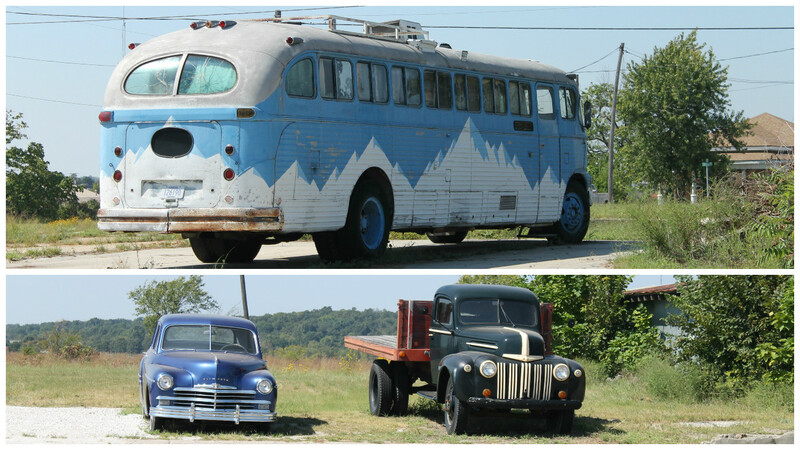 A quirky roadside oddity. It was built by Hugh Davis, a Tulsa zoologist as a gift for his wife. He started the project in 1970 and completed it with the help of friends in 1972. The Whale sits in a pond on his property and is 20-feet tall and 80-feet long. As the project was coming to completion it drew the attention of people exploring Route 66, so they opened the gates and let them in. His daughter Dee Dee and her husband now run the sight. 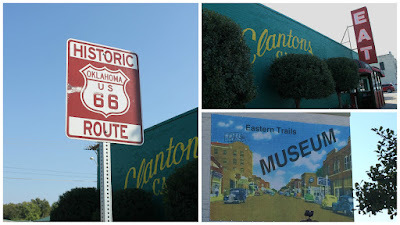 Next up is Chandler, OK where we will be staying right on Route 66. ~ The power of a vent fan. We have two ceiling vent fans, one in the kitchen area and one in the bathroom. 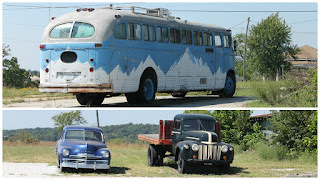 They help to keep the RV cool and the air circulating. The one in the kitchen helps to clear heat generated when cooking and clears any food odors. While one would think the same could be said for the bathroom fan, you do have to be careful or you could make the odors worse. If the toilet lid is not closed when you flush (which studies show you should do anyways because the water can spray up to 6-feet - think on that for a minute) the vent fan pulls the odor and gasses up from the black water holding tank. This is not a pleasant experience! So keep a lid on it.